Clouds, fog and mist droplets are small enough that when light interacts with them its wave nature is significant. Light is not simply refracted or reflected at the drop surface. Instead, its waves are scattered or diffracted in all directions to produce a wildly oscillating ringed pattern right around the sky. 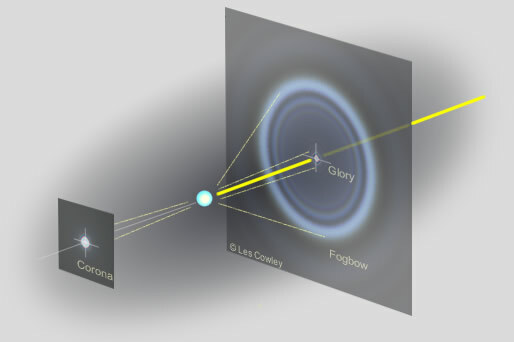 We see only the pattern's brightest parts; the coloured corona around the sun, the ringed glory directly opposite the sun and a large ghostly white fogbow. Raindrops are 10-1000X larger than cloud droplets and their diffraction effects are consequently small.. Their coronae and glories are insignificant and instead of a diffuse fogbow they form a sharp rainbow. Mouse over the droplet size panels to compare cloud droplets and raindrops. The scattering patterns are accurate simulations made by IRIS.